O. M. G. I about dislocated a finger bookmarking the Unique Sheep site! Where has it been all my life????? Oh, tax refund, tax refund, come to me . . . 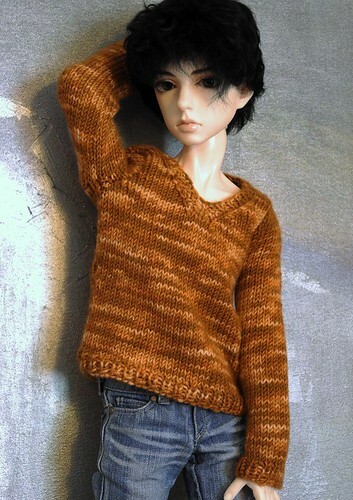 I wonder whether my slim-girl pattern would be the right proportions for him? Hmmmmm--as I have time, let me dink around with a sample, and we'll see whether it works on him, 'k? When you have a chance, though, would you send me the length from his wrist to his armpit, and from his underarm to wherever you'd want the hem of the body to fall? Those measurements seem to make the most difference in sweaters--I've learned that a little width more or less is usually not as big a deal to the eye as ill-judged sleeve and body lengths. Aw, hugs! It's all the yarn--I am a total yarnholic, now that I've discovered these incredible handspuns and handpainteds. I grabbed the gorgeous storm-fogged Perfect Union on sight. I want to wear it myself!! Oh, happy (and grateful) sniffles! Just refunded your friends discount, BTW, and I'll have your package on the way tomorrow. :) I adore those WhimsyKnits yarns--I can hardly believe they're handspun, because they are so perfectly even and balanced. Some people have mad, mad, mad skillz! Yeah, some people do - like you! This is actually for my SDC, he's going to semi-drown in it (on purpose) and this sweater may have messed up my whole styling plan for him, but I can't resist. 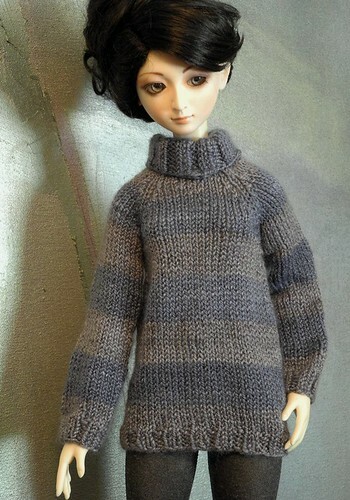 I'm sure I can figure out a way for a Dickensian street urchin to wear a sweater. People rarely do things in these sorts of colors because they're not exciting or eye-catching, but they are my very favorites and I am thrilled to death that I get to own this piece.